For both basic research and the development of cell and gene therapies, it is often crucial to separate the cells of interest from heterogeneous cell mixtures at a high viability rate, purity, and yield. For almost 3 decades, MACS® Technology has been, and still is, the gold standard in cell separation as it offers exactly these compelling benefits. 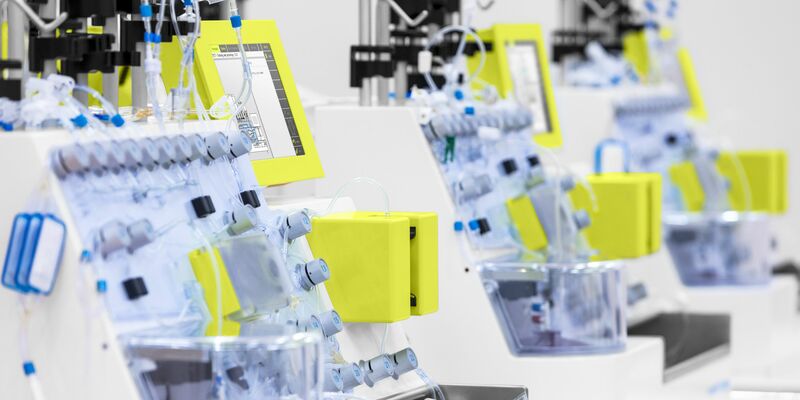 With this technique, Miltenyi Biotec revolutionized cell processing for both basic research and clinical application – from the first MACS MicroBeads to a clinical-scale cell manufacturing platform, the CliniMACS® System. MACS Technology owes its longstanding success to the combination of superparamagnetic nano-sized beads and a very high magnetic gradient within MACS Columns. This combination allows for minimal labeling of target cells and therefore, preservation of cell integrity and characteristics. MACS MicroBeads are biodegradable and compatible with all downstream applications, including cell sorting, flow cytometry, cell culture, functional assays, and molecular analyses. 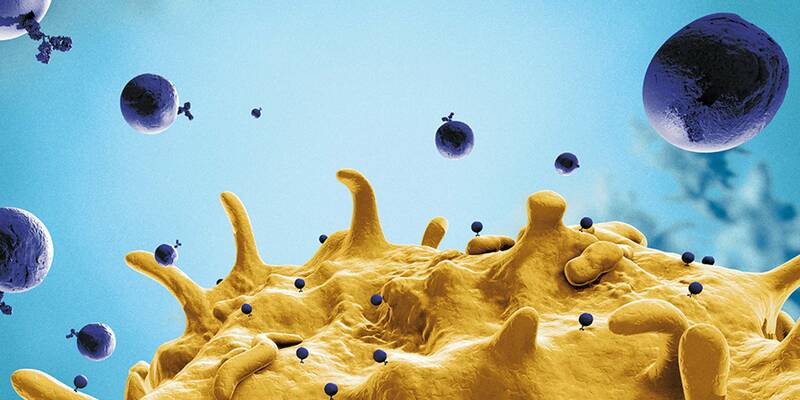 Cell isolation with MACS Technology (RUO). In this example, cells are isolated by positive selection, which means that the target cell type is magnetically labeled. During separation, the column is placed in the magnetic field of a permanent magnet, the MACS Separator. Magnetically labeled cells are retained within the column, whereas unlabeled cells flow through. After a washing step, the column is removed from the magnetic field, and the target cells are eluted. Likewise, target cells can be isolated by magnetic labeling of unwanted cells and subsequent depletion of the labeled cells. MACS Technology enables the isolation of a wealth of cell types for immunology, neuroscience, cancer, stem cell, and cardiovascular research. The method is both gentle and effective. Therefore, cells are isolated to high purity at high yields and viability. These are fundamental requirements not only for basic research, but also for the translation of the discoveries into clinical application. Based on MACS Technology, the CliniMACS® System allows researchers and clinicians to explore the potential of specific cell types for the development of novel therapies in the fight against serious diseases, including cancer. Flow cytometric analysis of CD14+ cells enriched by the CliniMACS CD14 System. CD14+ monocytes provide the basis for generating monocyte-derived dendritic cells, which are promising candidates in the development of effective cancer therapies, for example. Right from the start, Miltenyi Biotec’s goal was to provide tools for both basic research and its translation into clinical application to advance cellular therapy. Consequently, in 1997, the CliniMACS CD34 System received the CE mark, registered as a medical device in Europe, and was officially introduced into the market. This system enables the clinical-scale cell enrichment of CD34+ hematopoietic stem and precursor cells in a closed system. Over the intervening years, tens of thousands of patients were treated with CD34+ cells enriched by the CliniMACS Plus System in clinical studies conducted worldwide. 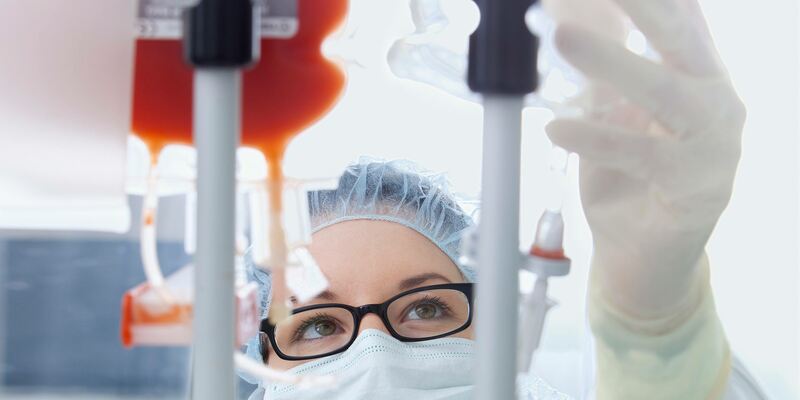 Finally, in 2014, Miltenyi Biotec’s constant quest for advancing cellular therapy culminated in the US Food and Drug Association (FDA) approval of the CliniMACS CD34 Reagent System for the reduction of chronic GVHD in patients with acute myeloid leukemia in first complete remission undergoing allogeneic stem cell transplantation from an HLA-identical sibling donor1. Continuous efforts of Miltenyi Biotec’s R&D Department in collaboration with researchers throughout the globe led to the development of a multitude of applications in the fields of graft engineering, immunotherapy, and tissue regeneration. The versatility of the CliniMACS System resulted in more than 200 Investigational New Drug Applications (INDs) or Device Exemptions (IDEs) at the US FDA and over 150 clinical studies in the EU and the rest of the world. Annually, more than 2,500 patients receive CliniMACS System-manufactured cell products. Comparative outcomes of donor graft CD34+ selection and immune suppressive therapy as graft-versus-host disease prophylaxis for patients with acute myeloid leukemia in complete remission undergoing HLA-matched sibling allogeneic hematopoietic cell transplantation. Pasquini MC, Devine S, Mendizabal A, Baden LR, Wingard JR, Lazarus HM, Appelbaum FR, Keever-Taylor CA, Horowitz MM, Carter S, O'Reilly RJ, Soiffer RJ. J Clin Oncol. 2012 Sep 10;30(26):3194-201. doi: 10.1200/JCO.2012.41.7071. Epub 2012 Aug 6. Disclaimer: Unless otherwise specifically indicated, Miltenyi Biotec products and services are for research use only and not for therapeutic or diagnostic use. MACS® GMP Products are for research use and ex vivo cell culture processing only, and are not intended for human in vivo applications. For regulatory status in the USA, please contact your local representative. MACS GMP Products are manufactured and tested under a quality system certified to ISO 13485 and are in compliance with relevant GMP guidelines. They are designed following the recommendations of USP <1043> on ancillary materials. The CliniMACS® System components, including Reagents, Tubing Sets, Instruments, and PBS/EDTA Buffer, are designed, manufactured and tested under a quality system certified to ISO 13485.In the EU, the CliniMACS System components are available as CE-marked medical devices for their respective intended use, unless otherwise stated. The CliniMACS Reagents and Biotin Conjugates are intended for in vitro use only and are not designated for therapeutic use or direct infusion into patients. The CliniMACS Reagents in combination with the CliniMACS System are intended to separate human cells. Miltenyi Biotec as the manufacturer of the CliniMACS System does not give any recommendations regarding the use of separated cells for therapeutic purposes and does not make any claims regarding a clinical benefit. For the manufacturing and use of target cells in humans the national legislation and regulations – e.g. for the EU the Directive 2004/23/EC (“human tissues and cells”), or the Directive 2002/98/EC (“human blood and blood components”) – must be followed. Thus, any clinical application of the target cells is exclusively within the responsibility of the user of a CliniMACS System. In the US, the CliniMACS CD34 Reagent System, including the CliniMACS Plus Instrument, CliniMACS CD34 Reagent, CliniMACS Tubing Sets TS and LS, and the CliniMACS PBS/EDTA Buffer, is FDA approved; all other products of the CliniMACS Product Line are available for use only under an approved Investigational New Drug (IND) application or Investigational Device Exemption (IDE). CliniMACS MicroBeads are for research use only and not for human therapeutic or diagnostic use CliniMACS, CliniMACS Prodigy, MACS, MACSQuant, Tyto and the MACS logo are registered trademarks or trademarks of Miltenyi Biotec GmbH and/or its affiliates in various countries worldwide. Copyright © 2018 Miltenyi Biotec GmbH and/or its affiliates. All rights reserved. Humanitarian Device: Authorized by U.S. Federal law for use in the treatment of patients with acute myeloid leukemia (AML) in first complete remission. The effectiveness of the device for this indication has not been demonstrated. Indication and Usage: The CliniMACS CD34 Reagent System is indicated for processing hematopoietic progenitor cells collected by apheresis (HPC, Apheresis) from an allogeneic, HLA-identical sibling donor to obtain a CD34+ cell-enriched population for hematopoietic reconstitution following a myeloablative preparative regimen without the need for additional graft-versus-host disease (GVHD) prophylaxis in patients with acute myeloid leukemia (AML) in first morphologic complete remission. Contradiction: Do not use CD34+ cells prepared with the CliniMACS CD34 Reagent System in patients with known hypersensitivity to murine (mouse) proteins or iron dextran. Warnings: Do not infuse the CliniMACS CD34 Reagent or the CliniMACS PBS/EDTA Buffer into patients directly.